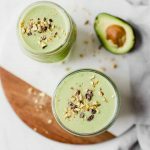 The Ultimate Green Avocado Smoothie! Made with avocado, banana, kale, almond milk, and protein powder (optional). Top with pistachios and cacao chips for a great way to start the day! This green avocado smoothie is vegan, vegetarian, gluten-free, and dairy-free. My husband and I typically start our days off in a hurry. While we love our slower mornings on the weekends (hello, yummy Healthy Sweet Potato Pancakes), our weekday mornings are a sprint to feed the baby, get him changed, get ourselves ready, and send the hubs off to work while I get ready to work from home. With such a busy start to the day, a quick and easy breakfast recipe is completely essential! 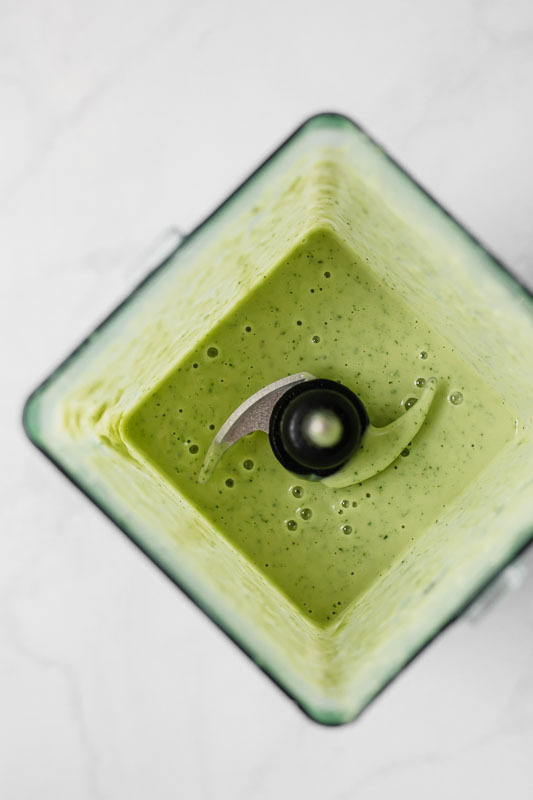 This green avocado smoothie recipe is one of our favorites for making in advance and freezing for busy mornings (more on that below). Just make a big batch of the recipe, pour into mason jars, and keep frozen to take with you during the week. It’s a lifesaver! This Green Avocado Smoothie is the ULTIMATE healthy breakfast recipe for busy mornings! Smoothies are always a great idea for a quick breakfast! They’re delicious, easy to make, and loaded with nutrition. Green smoothies are especially good for you since they’re filled with dark leafy greens, such as kale and spinach. They’re full of healthy fats, vitamins, minerals, and antioxidants! Combine avocado, kale, almond milk, and a banana in the blender. Add in vanilla protein powder to make the smoothie even creamier! My favorite protein powder for this green avocado smoothie recipe is the Tone It Up Vanilla Protein Powder. I love that it’s vegan, plant-based, and gluten-free! Banana pairs wonderfully with avocado in a smoothie. Other great fruit options are apple, orange, pineapple, mango, or blueberries! This green avocado smoothie is perfect for making ahead and freezing! Simply blend the ingredients together, pour into mason jars, cover with lids, and store in the freezer for up to 3 months. Once you’re ready to drink the smoothie, either thaw it out in the refrigerator for two hours (or overnight) or heat it up in the microwave for about 1 minute. P.S: The Ninja blender is AMAZING for making quick and easy smoothies! It even comes with 16 oz. cups for smoothies. Definitely recommend if you make or want to start making smoothies often! Remove the avocado skin and peel the banana. 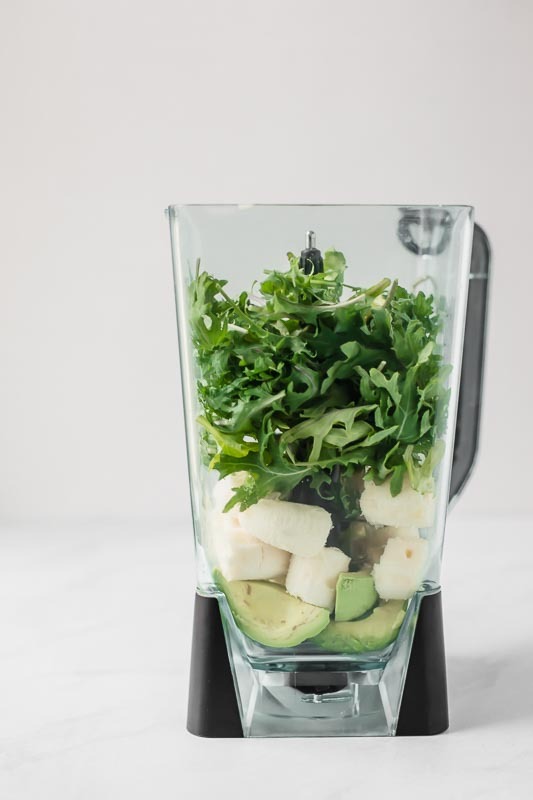 Place the avocado slices, banana, baby kale, almond milk, and optional protein powder in the blender. Blend until the smooth and serve or freeze for later! Servings - feel free to double or triple this recipe if you're making this in advance and freezing! Love green smoothies but don’t have the time to make them? Try having them delivered to your front door! Here’s 25$ towards your first SmoothieBox! This is the perfect smoothie! I’ve been looking for a good green smoothie to try. I love that this one has avocado in it! It’s so yummy! The avocado makes it extra creamy. Glad you enjoyed the recipe!